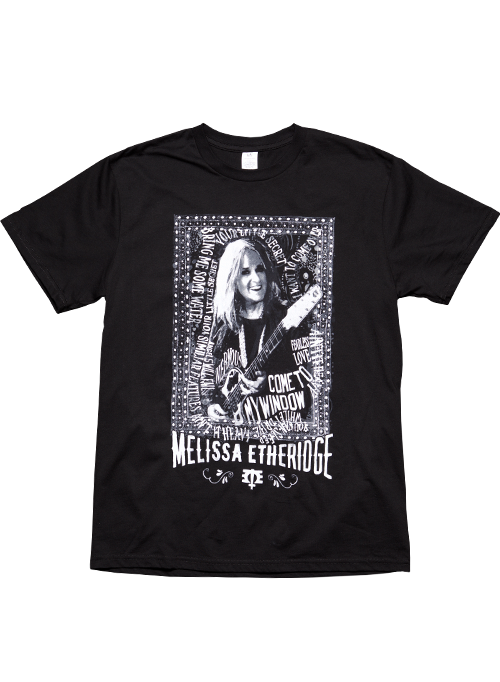 If you saw Melissa Etheridge on her 2016 tour but didn't pick up a souvenir T-shirt, now is your chance! This creatively designed black 100 percent cotton T-shirt features photo art of Melissa playing her guitar, surrounded by her song titles through the years. Her 2016 tour dates are printed on the back. On the front of the shirt at the bottom, there is also her stylized ME logo. This is a wonderful gift for a dedicated Melissa Etheridge fan, especially since some of her best-loved songs adorn the front of this premium quality short-sleeve T-shirt.